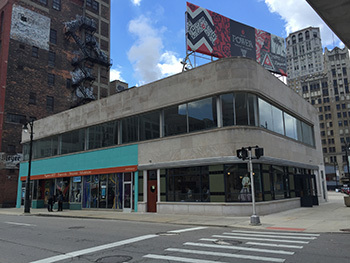 On May 21, restaurateur Paul Howard and operating partner Sam Spruill plan to open a new bar and restaurant called Queens at the corner of East Grand River and Farmer Street, located just north of the downtown branch of the Detroit Public Library. Howard acquired the two-story structure in 2012, and over the last several months has been renovating the space along with a lower level. 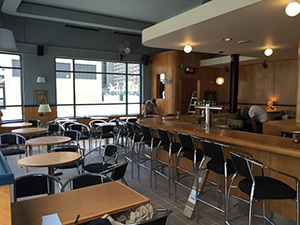 The 75-seat bar and eatery has some Art Deco touches, and is outfitted with maple paneling and trim, a ceramic tile floor, decorative light fixtures, and a mix of paintings. Located next to the Puppet Art Theater, which is operated by the Puppet Art Center, Queens will offer 16 beers on tap, a full bar, and a kitchen. The lower level houses a prep kitchen, mechanical equipment, and bathrooms. The building, located at 35 E. Grand River, was constructed in 1937, though the foundation and north wall date to the 1880s, Howard says. Signage will be added in the coming weeks, along with a 50-seat patio along Farmer Street. Queens will offer entrance doors on East Grand River and Farmer Street. Mike McCleer, principal of McCleer Architetto in Detroit’s Woodbridge district, did the exterior renovation.